We design and supply custom designed sub sea pressure housings for a wide range of underwater engineering applications. These sub sea housings have been designed and produced using metals, engineering plastics and composites. Alongside is a stainless steel underwater pressure housing for electronics. 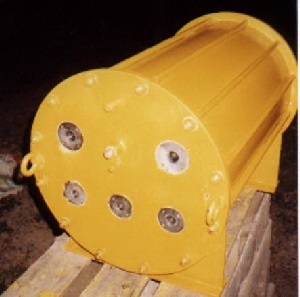 The housing was designed for long term immersion and was painted in order to minimise the consumption of the zinc anodes protecting the whole skid. 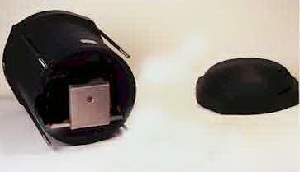 Below it is a photograph of a lightweight underwater housing using modern engineering plastics. We are currently designing a range of new lightweight deepwater housings using some of the most advanced metal matrix composite materials available today. The metal matrix composites provide great advantages for deep water applications. We can now offer housings for 6000m which are near neutral bouyancy, and even in some cases positively bouyant. This provides considerable payload and hookweight benefits for free swimming underwater vehicles. We are also working on subsea pressure housing designs for operation at full ocean depth, 10915m, the bottom of the Challenger deep.